Nothing quite says "70s" like a macrame'd terrarium overflowing with lush ferns. I'm not talking from experience here, I was born in the 80s. 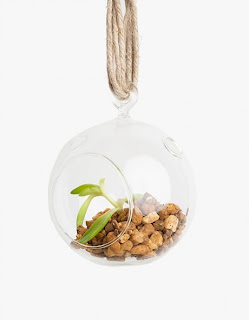 With that said - I'd love to have a living room full of macrame'd hanging terrariums. And 70's print sofa. If you prefer your hemp on the skimpier side, check out this hanging terrarium from needsupply.com. It is a cute idea and I daresay you could mimic this look for pennies on the retail-priced dollar. Go forth crafters!